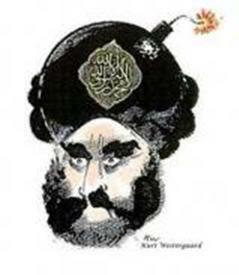 In 2006 Muslims went on a murderous rampage after this offensive cartoon was published in a Danish newspaper. Over 100 people were murdered in the cartoon rioting. It looks like the cartoonist was ahead of his time. A Muslim suicide bomber blew up the mayor of Kandahar City today. He hid the bomb in his turban. “Ghulam Haider Hamidi, the mayor of Kandahar, was in meeting with some people when a man placed explosive device in his turban entered the meeting hall and blew it up, killing the mayor and injured another,”a statement released by kandahar’s provincial administration said. Afghans are familiar with suicide attacks, roadside bombings and gun shoots but it appears to be the first time that a turban bomb suicide attack rocked an Afghan city and claimed the life of an official.